Improving efficiency in the workplace will make a big impact on the way you work and on productivity. Taking practical steps to create changes will help you manage and organise your time more effectively. Working within the restraints of a time schedule offers many opportunities for positive change. It is difficult to work productively in chaos. Therefore efficiently organising your workspace is the ideal starting point to implementing changes. Processing documents as soon as you have read them, delegating tasks and structuring your working day to run as a timetable will enable you to manage your time to your advantage. Changes can only be made after you have organised your time to identify areas where change could create improved productivity or results. Clearing space in your timetable of tasks will be necessary before you can create changes to your time schedule. An assessment of the changes you want to make will then be required. Swift changes can be made in many areas. If you are working within time restrictions you will want to use the time you have available in the most productive way possible. Releasing tasks by delegating them to other people is an instant way to free up your time, so that can you can work more effectively on another task or project. Prioritising your workload and cutting out any unimportant or non-urgent task will also streamline your timetable considerably. If you regularly deal with a large amount of paperwork learning to manage the amount of time you spend reading, processing and filing will enable you to improve your efficiency. Delegating the opening of mail, if appropriate, will allow you more time to deal with more important tasks. Skim reading documents will enable you to identify the urgency level of the contained message, before you provide a quick, handwritten response or a more detailed reply. Doing this will reduce the volume of paperwork you have to handle and give you more time. 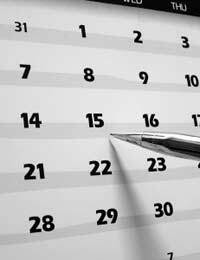 Your time schedule will dictate how much room there is available for implementing any changes. If you are able to regularly review your schedule you will benefit from opportunities to identify areas that can be instantly improved or changed. Acknowledging the importance of the schedule will enable you to use this timetable in a productive way. Accepting that you have to work with restrictions will enable you to explore ways of adding time to your day. Utilising technology – email and internet - and delegating and reviewing will provide ways of making positive instant changes. Organise yourself. Streamlining your day, thoughts, tasks etc will enable you to tackle any problems, ideas or work more confidently and within your time restrictions. Review your schedule as frequently as possible. The more you do this the more opportunities for creating improvement, or making changes, you will discover. Acknowledging the importance of tasks will enable you to focus on your workload in an efficient manner, and prioritising will help create a more productive result. Use technology to help you organise your day. Using email and the internet can provide quick ways to access and relay information.